It was a status update on one of CCP Seagulls original road maps – showing us where the game was going with structures. 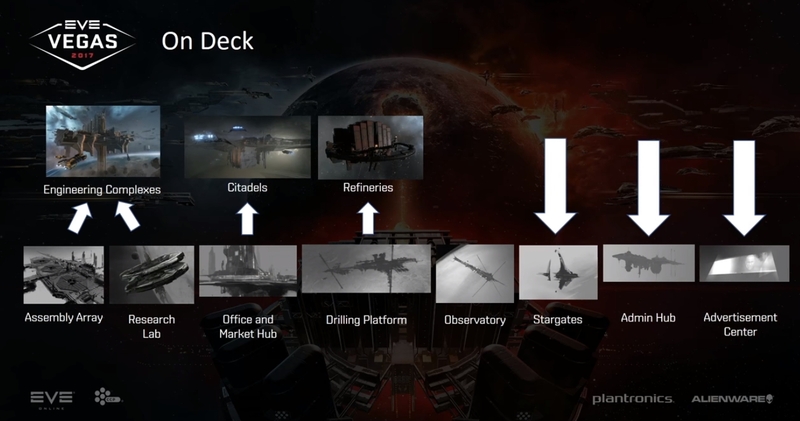 CCP Fozzie reinforced those last four areas would take years to cover off, but indicated in the moderate future they were working on the Advertisement Centre. I thought this was an odd choice – but it might simply be low hanging fruit. The Advertisement structures would take up the function now covered by depots, cans and TCU’s for players to advertise their Corporations and label space and what not. Also in the same sort of timeline are Stargates – but not the grandiose future some of us initially thought. They were described as the structure version of the POS Jump Beacons and Cyno Jammers. Eventually CCP Fozzie said the Admin Structures would take over ihubs and possibly the Sov System. I’d forgotten about that Road-map.
. 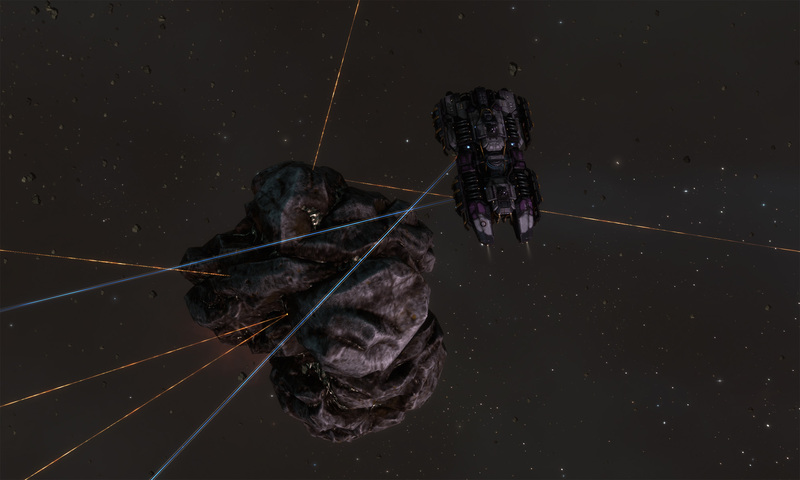 The Rewards – especially in Hi-Sec, will be minor when compared to Low and Null Sec. It is more about the experience than the wallet balance. I think all of that is a good thing. I won’t be able to participate in this as a Hermit player in the initial land rush. I wouldn’t expect to. Maybe in a year or two down the track I could Ninja in on an abandoned moon somewhere. Last thing to note is the result of the Blaze charity skin event. I hope at some point in the future Mrs Blaze and Mini Blaze gain just a little comfort from having so many people thinking of them and Blaze. We get two common unsolicited phone calls to the house. The first is a scam pertaining to be from the Telstra Help desk (the biggest Telecommunication company in Australia) saying your computer is infected by viruses and that they need to remotely connect to fix it. The second is trying to sell you solar panels. We have got both types of calls up to 5 times a week for many years now. That is – literally – more than 1,000 times each. I have been in Jita a bit of late, playing the 0.01 ISK wars against bots and no-lifers. I see the same old scams in local that I’ve been seeing for years. Most individual messages are repeated 30 odd times an hour, more than 1,000 times a day. Another area where EVE imitates real life I guess. I know the argument is that they get a minuscule success rate which makes it worthwhile. Surely the hit rate will increase however if they were just a little bit more creative? As an aside – I have found the most relaxed way to conclude the Help desk scam calls is by advising them that I don’t own a computer, or a tablet, or a smart phone. They usually just quickly hang up. On the rare time I get an incredulous query, I say I use Industrial cleaning equipment all day, and it leaves me with a high level of static electricity that resets electronic equipment when I touch them. While that is not true for me – it is something that impacts my Mother. Still solo if you use mining drones? I am still sporadically continuing the process to hermit build an Astrahus. By this I mean with just my main character, and not my main with an army of alts. I haven’t progressed far – but it has had its own positive impact on my game. I had got into the habit of logging in, spinning the ship, then logging off. This back-burner goal has turned every second or third logon into some sort of undocked session. It really puts into perspective the amount of effort required to solo build a Citadel as compared to the effort to solo kill one. In fact – from a solo / hermit point of view, I expect most things in the game require substantially more effort to build than it does to destroy. It is an equation I have always thought was heavily weighted against my style of play, yet from the complaints you would think it was the opposite in game. As I continue my EVE career wind down (while I wait for something relevant and new), I have been on occasion progressing one of my other goals. That is to end up with just the one EVE character. A true Hermit. I’ve found once mothballed, I have never re-used my Alts, so I have returned to them one at a time to strip them bare and biomass them. Not maintaining multiple characters has been quite liberating, although it is not always easy to let go of them. I’ve noticed this popping up – which I am not sure was there before. I expect that means if you have to PLEX an account to get at any SP below 20M odd that it won’t be worth doing. I wonder if that is a money grab, or if CCP is hoping less people biomass their characters if they still have an enforced useful level of SP. The EVE Online Updates page seems rather barren. The EVE Online Forums for upcoming features is in a similar state. There doesn’t seem to be anything we are not already aware of in the Test Server Feedback forum either. In the pipeline we only have the Structure 2.0 updates, Heavy Assault Cruiser and Assault Frigate balancing, and the once off Faction Citadels arriving to replace Player Stations. Others have blogged about the bare state of the future roadmap recently, but it is not something I am particularly concerned about. We have the 15-year anniversary Fanfest coming in April, and CCP seem to understandably like the theatrics of being able to do big reveals. We should learn more then. I expect however I wasn’t the only one to look carefully at the session list for the latest CSM summit in Iceland taking place this week. There wasn’t much given away, although I wonder at why they are brainstorming content for Winter 2018, when I would have thought that sort of thing should have been set long ago. It also just seemed to be talking about all the same old stuff. I don’t like the chances for Hermit players getting a strong look in, but it would be nice to be thrown a few crumbs. Here’s hoping. Maybe Dissociative Identity Disorder is the solution? I’ve ran POS before in High Sec and Low Sec – both to live out of and for Industry. I found the mechanic suitable for Hermit play, with an acceptable risk / reward balance. I always armed my POS. I knew it only took a half organised group to destroy them – but the difference was they needed to make at least a small effort to counter the defenses. This happened even if I could not log in. Maybe it is just me – but that made a lot of difference in being willing to plant my hard-earnt ISK out in space. Sven Viko wrote an interesting blog piece (as he is prone to doing) covering his year of killing Structures as a Solo player. While I’m distracted by how to defend them, he is distracted by how to destroy them. He remarks on the difficulty for solo attackers to get around the time zone tanking of the vulnerability windows. I complain about the difficult for a casual player who might not log in for a week to ensure they are online during vulnerability windows. CCP would probably just point out the discernable difference if you attack or defend in groups. He remarks that due to Asset Safety, his salvage and loot drops were well under 10% of the destroyed value. In fact, if not for a couple key module drops, the return would have been minuscule. I have sympathy for him here. He – and many others – made good ISK on cleaning up POS. I wouldn’t suggest Asset Safety need to be scrapped everywhere. It is a key part of CCP’s narrative about moving from indestructible to destructible Player Stations. I wonder however if there should be some mechanism where half the tax paid by pilots to get their stuff out of Asset Safety ends up in the pockets of the attackers? Like what they do to pay out bounties? Think of it as the proceeds of bribes paid by the removalists. He remarks on the binary nature of the Citadel v Player mechanic. The attackers are either impervious to the defences, or it is very risky. I don’t like that either. If I am defending solo, I’d like to think if I used suitable fits and tactics, that I could make some sort of difference or extract some sort of cost. Again, CCP would probably just point out the discernable difference if you attack or defend in groups. Last of all he remarks on the time taken as a solo player to destroyer Structures over 3 timers. I don’t really have an issue with the time he remarks on having taken to be honest. But – yet again – CCP would probably just point out the discernable difference if you attack in a group. The POS mechanics were viable for Solo Players. The Structure Mechanics have issues for Solo players – with the solutions mostly being not to play Solo. There has been a Structure 2.0 update announced – arriving some time soonish and making changes to the destruction mechanism. In particularly those structures not actively using fuel should be easier to kill. I don’t imagine that will make me any more inclined to use them! As a Solo player – when it comes to placing stuff out in space, you must rely on stealth, compromise, and a bit of luck. I’ve anchored and un-anchored maybe a dozen POS over my EVE Career. By carefully picked locations and my timings I could mitigate some (but not all) of the risk. I felt I had some sort of influence on the success of the action. The deployment of a Structure takes at least 24 hours plus 15 minutes. In High Sec – unless under War Dec or you get a War Dec in the first 15 minutes, the process is relatively safe. If I were to anchor a Structure in Wormhole space (something I had wanted to do), I must hope for 24 hours that none of the industrious wormhole mapping denizens happen across it. It is similar in Low or Null Sec. I can try picking a system that is very quiet, but it is just pure – and out of my control – luck if it anchors. I don’t find that good game play for the owner. The article is about the EVE Player Toni-anne Brinalle of the infamous Thieves’ Guild. There were several related articles – posted in the latter half of 2017. That player suggested they had stolen more than 500 Structures at the end of their un-anchoring process. How accurate that is I can’t say, but reading the various comments and things that were linked to at the time, there did seem to be an active and successful profession of identifying and in a timely manner scooping up Structures under the noses of their previous owners. There is no skill as a Solo player that I can use to mitigate such a risk. I get that things might be different for un-anchoring, if I played in a Group instead of playing Solo. I am almost seeing a pattern here. But – no. The only solution I can think of for Solo player currently is to view Structures as ammunition. BANG, 10 ISK gone, BANG, 10 ISK gone, BANG, 10 ISK gone, Anchor, 1 Billion ISK gone, BANG, 10 ISK gone. I don’t like that mindset to be honest. Yes, only undock with what you can afford to lose, but you can moderate the risks you are exposed too through tactics and fitting and experience and knowledge. For Solo players I feel currently Structures don’t give you any real risk mitigating game play. Anyway – once again I write about EVE and it ends up just sounding like a whinge! The TLDR; my early concerns about the Structure Mechanics for Solo players remain. There is antidotal evidence my concerns are valid. I don’t see any changes in the pipeline to improve on this – aside a Solo attacker should find the destruction process easier after Structures 2.0 is released. I remarked the other day that I would not be migrating some of my old and out of date EVE tools to my new PC. I knew there would be a point where they would stop working for good. That point has now been announced. May 8th, 2018 – is when the old XML API / CREST will be turned off. Only the ESI API will be supported going forward. Armageddon day for some of our old favourites.